We have teachers who between them can cover almost all of England and Wales. 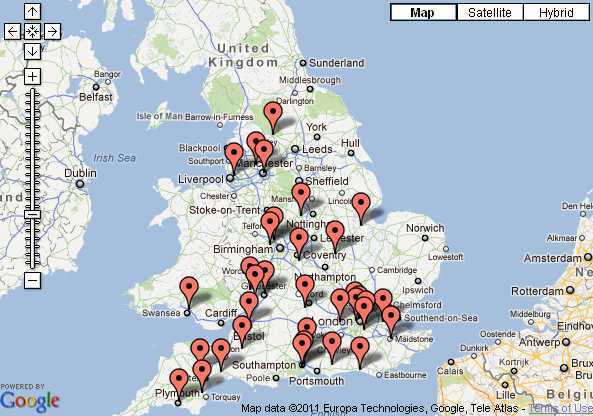 Look at the map below to see some of the places we have visited. Although we specialise in Victorian days we can also offer ROMANS, TUDORS, WW2, VIKINGS and others. This map shows just some of the areas we have visited with our Victorian School Experience. Click for larger version. 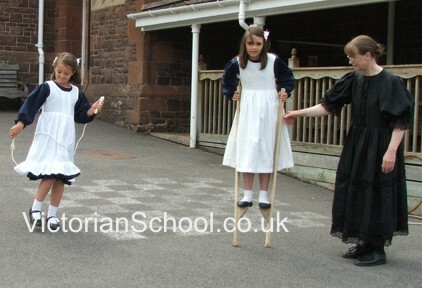 If you are unable to visit a real Victorian School with your class you might like to consider a visit to your school by an experienced "Victorian" teacher. An explanation of how Victorian Schools functioned: Strict teachers; standing up until told to sit down; standing up when a teacher enters the room; deportment; personal hygiene; respect for Queen Victoria. Learn how to ask questions and to be seen but not heard. An introduction to writing including using a sand tray; writing using a slate; the blackboard and easel; copy writing and copybooks; pens and ink. Children have a chance to try out forms of writing. Punishment and behaviour in Victorian schools; the cane; the dunce's cap. Strict discipline. Reading and Writing. An examination of a Victorian textbook. The abacus, tables and recitations. Victorian morality and beliefs. Religion and the Victorian child. The high death rate especially amongst children. The British Empire. Great Victorians, and Victorian inventions. We usually provide a drill lesson (physical training) subject to availability of space, and we also give children an opportunity to try out Victorian games. NOTE: The exact content of lessons varies according to available time and age and ability of children. We bring a number of items to assist in our talk, which varies according to age and local conditions. We might bring slates, a picture of Queen Victoria, a blackboard and easel, charts and teaching aids, Victorian text books, pens and ink and many other items. For play we bring a selection of Vintage games such as marbles, stilts, top, skipping ropes and diabolos. We can bring a selection of artefacts to illustrate specific talks, such as kitchen and washing items, and domestic items. What we bring will depend upon the time we have with the children, and many other factors, but if you have a particular need please discuss it with us. 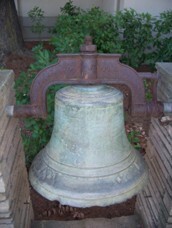 A Victorian lesson takes about 30-45 minutes depending on the age of the children (shorter for younger children). Drill can take 10-20 minutes with additional time for playing with the games. A suggested timetable is given below. Ideally the lesson should be in an old fashioned classroom, but usually this is not available, so the next best thing is to set up desks or tables in rows, a bit like for exams. For drill we would need a playground or suitable sports hall, or we could do a limited amount inside. We welcome the presence of teachers and visitors, but would ask them not to talk during presentations as this tends to spoil the atmosphere of the Victorian learning experience. We do cover other historical periods. We have a new website coming soon which gives details, but in the meantime please ask.